Apple’s fortunes in the mobile PC arena continue to flourish, according to a report by market research firm NPD DisplaySearch. The company released preliminary results for shipments of mobile PCs in the fourth quarter of 2011—numbers that have Apple outpacing its nearest competitor by more than 14.7 million units. That figure isn’t limited to notebooks. In making its calculations, NPD also includes tablets, such as Apple’s iPad. By that measure, NPD has Apple shipping an estimated 23.4 million laptops and tablets, for a 26.6 percent market share during the quarter. HP placed a far-away second, with just 8.7 million units and a 9.9 percent share, while Dell and Acer nearly tied for third with 6.9 and 6.8 million units respectively (and shares of 7.9 percent and 7.7 percent). Lenovo rounded out the top five with 6.3 million units and 7.2 percent share. Take the iPad out of the picture, however, and Apple drops to fifth place, with just 4.6 million laptops sold; HP, Dell, Acer, and Lenovo maintain their relative positions in the top four. That said, Apple continues to sell more Mac laptops per quarter than its PC competitors. According to the company’s first quarter 2012 financial report, Apple sold 3.7 million laptops, a 28 percent improvement over last year’s first quarter. In contrast, NPD says the overall notebook PC market grew only 11 percent year-over-year. When you home in on tablet shipments alone, Apple’s lead is truly extraordinary: NPD reports that the company leads the pack with 59.1 percent of the market and 18.7 million units sold, followed by Amazon (5.3 million units, 16.7 percent share). Amazon does not disclose quarterly sales figures for its Kindle products, so it’s difficult to determine how accurate NPD’s estimate really is. 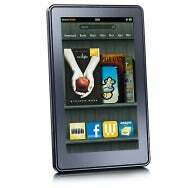 In December of 2011, however, the retailer did disclose that it had been selling a million Kindles a week. That said, in the tablet market, non-iPad devices continue to not pose much of a threat to the iPad, though low-cost alternatives such as Amazon’s Kindle and Barnes and Noble’s Nook are faring better than those priced competitively with Apple’s device. Apps could be a factor here. Apple boasts around 140,000 native iPad apps; there are far fewer Android apps optimized for tablets, nor is it readily apparent when browsing the Android Market online store which apps are designed with tablets in mind.